This year, most Vermont schools are in the process of solidifying the standards by which the next generation of graduates will be measured. Unfortunately, with all the attention paid to district consolidation and Common Core test results, we don’t hear much about these efforts. But the redrafting of our standards is crucial work. The standards express what we expect our young citizens to know and be able to do. Indeed, they convey what kind of people that we expect our children to become. As schools recommit to their graduation standards this year, the academic skills to be named are not really in question. The skills are spelled out in long lists we know as the Next Generation Science Standards, the Common Core, etc. What doesn’t get specified is anything about the kind of context in which students will acquire and apply these skills. What hangs in the balance is whether our students will be asked to acquire knowledge for knowledge’s sake, with the promise that it will prove useful later in life, or be guided to acquire skills and understanding through meaningful application and practical problem solving. There are ways to write the standards such that they become drivers of student work that has deep relevance to the needs and identities of young people and their communities. There are ways to write the standards such that we make a dent in that troubling and persistent statistic from the Vermont Youth Risk Behavior Survey: that only half of our teenagers feel valued by their community. • The number of times the proposed graduation standards, across all content areas, include the word “democracy:” once. • The number of times “Vermont” appears in the Vermont standards: zero. • The number of times the word “local” appears in these standards: once. • How many times does the word “entrepreneurial” appear in the graduation standards? None. • The number of times the word “community” appears: once. • True or false, the proposed graduation standards in science include the word “climate?” False. • The number of times the proposed standards include the word “citizen”: once. • The number of times the proposed standards include the word “stewardship”: zero. • The number of times the words “practical” or “application” or “build” or “make” appear in the Vermont graduation standards in math: zero. The presence/absence of specific words is critical because there are only five to eight core standards in each content area. Every word counts. These are the expectations that will appear on student transcripts. These are the commandments that will go on the walls of classrooms, and in syllabi, shaping everyday teaching and learning. The Agency of Education has done a fine job of distilling thousands of national standards into concise lists of key skills in each content domain. And people familiar with the graduation standards – also called proficiency-based graduation requirements – will note that there is a separate list of “transferrable skills,” including “practical problem solving,” and “citizenship.” This is good. But if we really value citizenship, practical problem solving, and engagement with contemporary concerns, it is important to explicitly drive those expectations into the core content area standards and classrooms. This is where students spend most of their time; these are the domains in which teachers are certified and the subjects about which they are most passionate. I’m not suggesting that academic abstraction and rigorous theoretical work don’t have their place. But theory and abstraction should be coupled with practical problem solving: the direct involvement of students in our communities, ecosystems, politics and economies. This is how young Vermont residents become powerful Vermont citizens. If we don’t write our standards in this way, we risk compartmentalizing citizenship as an aside, something you do after school, a special project, a stand-alone service learning trip. Citizenship risks becoming a checklist, or a log of hours: 30 minutes here volunteering at the library, an hour here picking up litter. Such efforts are important, for they can be gestures of sincere caring and community building. But when schools think of service in this way, it’s a far cry from conceiving of citizenship as the very context and reason for acquiring knowledge and skills in the first place. All learning should be service learning – done in the service of making our selves and our world a better place. In the words of Vermonter John Dewey, “The ultimate test value of what is learned is its use and application in carrying on and improving the common life of all.” Yes, and our standards should convey this explicitly. Our students will rise to the occasion. And our towns will see even more young people graduating with marketable skills, connections to the local economy, knowledge of the local ecology, strong college readiness portfolios, adult allies all over town, and a deep sense of their own power to shape this world for the better. T. Elijah Hawkes is a father, writer, educator. The views expressed in these posts are his own. He is Co-Principal at Randolph Union High School, in Randolph, Vermont. He was founding Principal of the James Baldwin School in New York City. His reflections on public schools, democracy and adolescence have appeared in VTDigger.org, Rethinking Schools Magazine, Kappan Magazine, Education Week, and Schools: Studies in Education. This commentary by T. Elijah Hawkes was written for VTDigger.org and published on September 10, 2015. 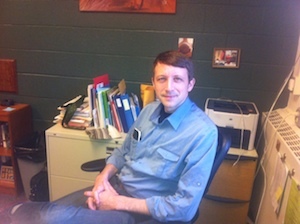 The original commentary can be found on VTDigger’s website at Elijah Hawkes: Defining context for graduation standards. Thank you to Elijah for his permission to republish his commentary here on the Rowland Foundation’s blog.